Every college freshman has a Dreaded Question. The sort of thing your roommate’s mom asks almost before you’ve shaken hands, that the Michigan-friendly cashiers on 8th Street will ask to start conversation. A hard, simple question. And frankly, I’m never really sure how to answer. Does my new friend want a fact sheet of my life history? Do they just want to know we have something in common? Or do they want to really know me as a person? Lord knows. Which elevator speech do I make? I’m a third-culture kid. Yes, like Cady Heron, but minus the seamless assimilation. I’m someone who has grown up in between countries, between languages, and between cultures. I’m not only American. I’m not only Malaysian. I’m somewhere in between: a third culture. I was born in Montana, in the shadow of the Rockies, to Malaysian Chinese parents (which is, colloquially, kind of like being both Polish and Jewish. One’s a nationality, one’s an ethnicity). I grew up both in Montana and in Malaysia, and have spent most of more life flapjacking between the languages, cuisines, and cultures that have now become my identity. We spoke English at home, but when R-rated family gossip was involved my parents switched to Cantonese. My mother’s family spoke Hokkien and English, but when I went out to a supermarket in Kuala Lumpur, we spoke Malay or Mandarin. But even English is a weird stream to navigate for me. When I’m in Michigan I find myself sliding into a creamy, nasal dialect of standard American English, but when I’m in Malaysia my diction takes on a rather British-Commonwealth color. And so it goes. But back to the Dreaded Question. I never know what to say. How much do they want to know? If I reveal that I am “the Other,” will I only ever be the Other in our relationship? If I only mention what we have in common, will they ever understand me when we don’t have values or childhood cultures in common? More often than not, I say, “Montana,” and smile breezily. It’s not a lie. I’m just not sure which truth you’d like to know. Which also perhaps explains why I’m a history major. It’s my answer to my Dreaded Question. It’s a way of plugging into the many, many voices of my Pasts. It’s a way of connecting the dots, and finding continuity in a story that’s been unfurling literally since records began. And TCK or not, we all have many pasts, and heritages that inform who we are. We “just” as Americans have political roots in the North European Protestant work ethic, in the Pagan Greco-Roman classics, and a cultural inheritance from all the peoples who have stumbled on our hunk of land between Spain and China. That’s a lot to unpack all by itself! The point is, we are the stories that have made us, and my major is about keeping those stories intact and relevant. Taking history at Hope has forced me to really evaluate the stories I tell myself, to weigh them in beside the many, many stories that built me. Under a history scholarship, I was even able to further my love of travel and my desire for origins, studying abroad in Athens, Greece, the heart of Western Civ as we know it. 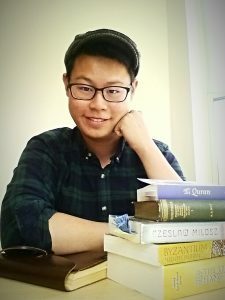 This summer, I conducted research on a swashbuckling Malay epic at the University of Michigan. Again, it’s all about connecting the dots, of piecing together identities, times, places, loves, and memories. And no matter where you’re from, knowing your story grounds you. It’s a versatile, portable, marketable asset. It’s a life skill everyone needs. And Hope has been a huge part of that journey for me; the road is long but I am grateful. Dear Joshua, I just read your essay in the NYT. Congratulations. I was astonished to see the Holland, MI below your name. As a 60’s graduate of that neandrathal institution, I had long ago give up hope (sorry) that it would evolve beyond Christian fundamentalism. Sorry, maybe you are a Christian too. Luckily for me I took classes in Indian philosophy and religion and went off to India where my real life began. Has Hope changed? I’d be surprised and happy to find out that it had. In the 60’s it had many liberal professors who opened my mind up, crack by crack. My classmates were John Cox and Kathy Verduin. I learned to be a kind of rebel at Hope (as much as I could). Not only that, I found a major in English Literature that changed my life and still affects it. So bravo for small liberaly arts colleges, constricted though they be by their backgrounds. And bravo for you. Next Next post: What Does a Professor Do During the Long Summer Months?